Akuzawa sensei’s Tokyo Open Seminar on 12th February 2018 coincided with a public holiday, accompanied by warm spring-like weather making the training that much more enjoyable. 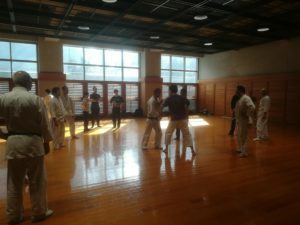 The seminar at the Shinjuku Cosmic Sports Center (seminar details) passed all too quickly, with the participants, some from overseas, gathering a lot of information about posture and its applicability to transmitting the weight naturally, used in exercises for connecting with the partner, and making space inside the body for movement. Akuzawa Sensei’s topic for this seminar was how to train the body to overcome the limitations of age. 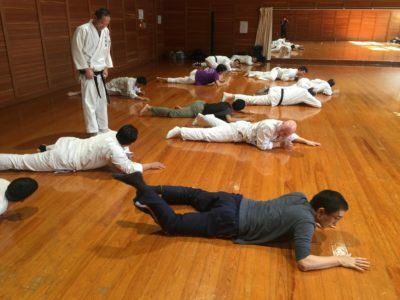 The initial part of the seminar involved stretching, especially the inner hip joint, inwards and outwards, on the ground, and then using the spine and hips to crawl forwards on the belly, followed by similarly on one’s back. This type of movement training is intended to help form a connected relaxed body without relaying on the upper body and shoulders to initiate movement. Thereafter, a very difficult and important partner exercise commenced, where one person stood heels and back flat against the wall, and the partner pushed in turn against the upper chest, middle chest, or abdomen with one hand. The objective was to stand straight against the wall, and practice using the slight tilting and straightening of the back and corresponding sinking of the body in the inner hip joint to absorb and return the push and thereby initiate forward movement. The creation of “space” between joints allows the internal realignment and dispersion of external force, and requires relaxation and self-awareness of one’s body structure and the ability to manipulate it sensitively. Next, the same type of connection was practiced without a wall as support. The person being pushed would absorb the push through the aforementioned straightening and sinking relaignment, and then let the hips glide forwards to one side of the pushing partner, legs following appropriately, sinking towards the ground, taking the partner with them if done smoothly. This “catching” of the push and subsequent ease of movement together with the connected partner, forms an important cornerstone of skill in unbalancing. 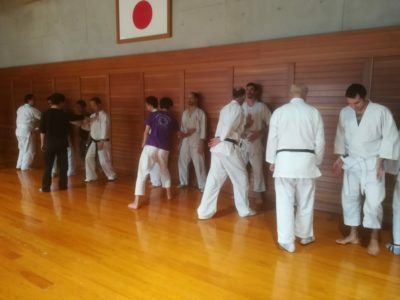 Having an entire seminar available to concentrate on a few critical aspects of training was a valuable experience for newcomers and regular members alike, and everyone felt grateful for the opportunity to learn from sensei and to explore this body movement with partners and integrate it further into their own practice. Training connected movement on the floor using legs and spine as much as possible. Training connected movement on the floor without using arms. Posture and absorption training against a wall, learning how to move forward. 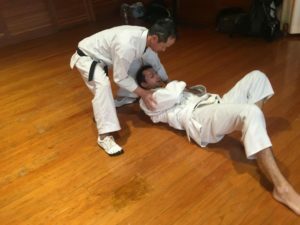 Akuzawa sensei demonstrating how to absorb and connect with partner as part of kuszushi (unbalancing).